Ok, that’s a very bold statement to make, but the achievement by ISRO is of such humongous proportions that the title is not far away from truth. Let us first look at 10 interesting facts about this Mangalyaan mission that will show you what our ISRO scientists have achieved. 1) India is the only country in the world to put a satellite in Mars orbit in it’s first attempt. No one has been able to achieve that feat till date. 2) Out of 51 missions to the Red Planet till date only 21 have been successful. 3) India is the only the fourth country after USA, Europe and Soviet Union to achieve this feat. 4) #Mangalyaan mission not only achieved it in the first go, but more importantly they did it at shoestring budget. Just to give you an idea, NASA’s maven that arrived in Mars orbit on Sept 21st cost them $671 million compared to ISRO’s Mangalyaan that has cost only $74 million. Check out the infographic below from WSJ that will show you the comparison. (and hence the title of this post). 5) To show you just how cheap Mangalyaan was – It has travelled 68 crore kilometer at a cost of 454 crore rupees, which means, it has cost Rs. 6.67 per kilometer. Even an auto rickshaw in India costs more. 6) #Mangalyaan was built completely Indigenously in India – The entire technology and development of this mission happened ground up in India. 7) Mangalyaan will explore the surface of Mars, its morphology, mineralogy and its atmosphere. Five solar-powered instruments aboard Mangalyaan will gather data to help determine how Martian weather systems work and what happened to the water that is believed to have once existed on the planet in large quantities. 8) At it’s closest point, Mangalyaan will be only 365 kilometers away from Red planet’s surface. 9) Interestingly, all scientists behind #Mangalyaan success are Indian educated. No foreign degree holders. 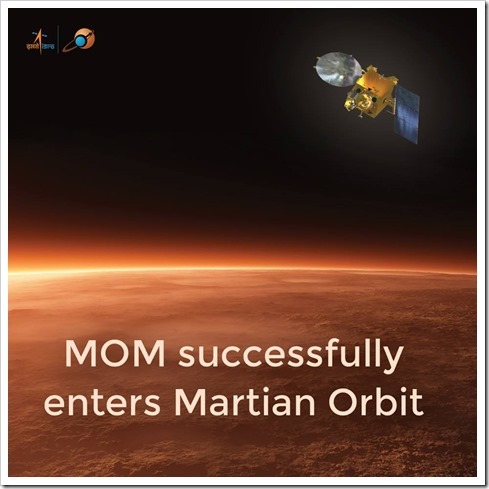 10) Mangalyaan was launched on 5th November 2013 and traveled to Mars in 10 months time. 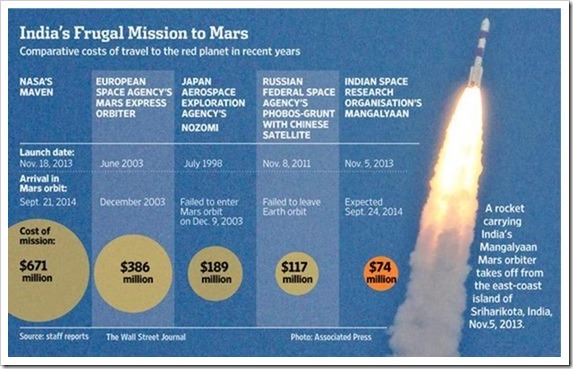 With Mangalyaan’s success, India has now firmly put itself front runner at the global space exploration arena. Countries around the world are going to look at India in awe atleast in the area of space exploration. Hearty Congratulations to entire ISRO team – I am a very proud Indian today! "#Mangalyaan, ISRO’s Mars Mission That Put NASA On A Pedestal", 5 out of 5 based on 1 ratings. Good Work ISRO! But please don’t put NASA to shame. It took many attempts to make the first flight, now even chinese are building planes. Am sure ISRO would have learnt from past failures of NASA. But Kudos, given the budgetary challenges we face in India… the scientists have done us all extremely proud.